The Beaumont has partnered with Heywood Hill, the iconic Mayfair bookshop which supplied the books in the hotel's bedrooms, to offer 'A Year in Books'. 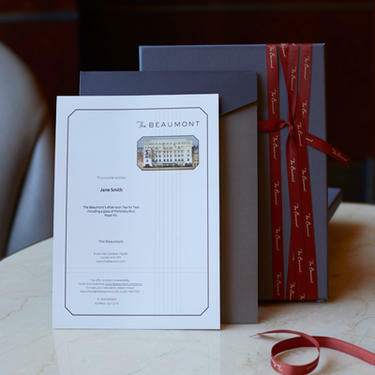 The gift voucher includes a one night stay at The Beaumont, with 'Help Yourself' coffee, tea, orange juice, home-made viennoiseries and preserves in The Cub Room each morning, and a subscription to Heywood Hill's luxury A Year in Books service. During a stay at The Beaumont, guests may visit Heywood Hill for an optional reading consultation with a dedicated bookseller who will ascertain the customer's personal reading tastes. Over the course of the following year, twelve carefully chosen and beautifully gift-wrapped new paperback* books will then be posted to their door: fiction, non-fiction or a mix of both. *Hardback service is available. Please contact Hotel Reservations on 020 7499 1001 for further details. Voucher Rate offered subject to availability. We also offer beautifully wrapped, gift-boxed vouchers. These will be posted to you or directly to your recipient, as desired - price includes postage & packaging.